Follow the Adventure with us! The Blue Bubble Bath range combines luxury with endless comfort to plunge you into a cozy world where every item has been designed to care for you. Super absorbent items, with out-of-this-world softness, innovative microfibers, elegant designs and modern trendy colors, have been developed to offer you a refreshing, peaceful and soothing respite to spend in the bathroom. Our Bodynamic range has been specifically designed for sports enthusiasts. We use only the best and most innovative microfibers on the market in our range. Light but powerfully robust, they guarantee perfect fast drying and pure comfort. Want to get away, go on vacation or just change environment? 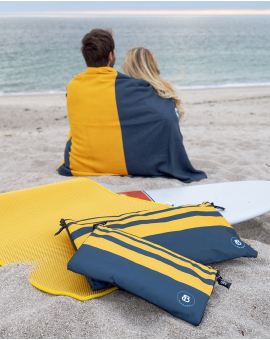 Our Evasion range offers sunshine-filled products made from high quality microfibers, designed for travel. Whether you're a once in a while get-out-there enthusiast, a nature lover or the intense outdoor type, this range is for you. Microfibers combine comfort with high technology. Lightweight and efficiency come together to give you products especially designed to accompany you on your travels whereever that takes you. Check out our High quality microfiber range, from bath linen, beach towels to sports or hiking towels. You'll be surprised by the awesome quality of our innovative items for every occassion. A perfect balance between technology and creativity. Take a dive into daily life we've just reinvented. The Blue Bubble team is thrilled to announce the qualification of Yann Blondel for the 2019 Mini-Transat! The magnificence of the Blue Bubble Boat!